One of the critical achievements on the long arc to human fulfillment is a capacity for getting over ourselves. Our chronic problems and pathologies are complications of a failure in this regard. We get tangled up, hooked, and held back from our true potential and end up settling for something we aren’t. Instead of focusing on the problem, however, I would rather look more closely at what fulfillment entails. The exquisite and sought-after experience across the spiritual wisdom traditions of higher culture is a direct realization that All is One, and that, further, the self is not separate from this oneness but belongs to it – or rather, that they are two aspects of the same mystery, contemplating itself. This isn’t merely a conclusion of logical thinking, where ‘all’ is the inclusive class of everything that exists, in which the self is necessarily a member. What is also called unitive consciousness is not a decision at the end of syllogistic argument, but rather a spontaneous intuition, an ecstasy of awareness in which the deepest center of oneself is known in perfect correlation with the infinite horizon of all things. Great spiritual lights of our species – again, without deference to culture or religion – have been taken by this mystical realization, and a few of them attempted to communicate the kernel of its insight to their contemporaries. They apprehended the translucent nature of reality where even ordinary things are epiphanies of the Holy One, and their personalities conveyed this self-same light. Witnesses and disciples praised them as unique revelations, glorifying and elevating them to the status of saviors, angels, and gods. Their message wasn’t from somewhere else, however; not one of them preached an ethic of separation and other-worldly escape. The ‘kingdom of heaven’ in Jesus’ teachings is nowhere but in the very midst of things, at the sacred center of life in this world. Unitive consciousness does not require the abolition of ego, of the sense each one of us has of our personal identity as an individual. It’s not by an erasure of self that the spontaneous intuition of oneness is gained, but rather by transcending it – affirming it, finding center, and then going beyond our individual self into a deeper and larger experience of wholeness. Again, the genuine mystics have long understood this. It is the rest of us – insecure and uncertain in our identity, entangled in neurotic attachments and stuck in our convictions – who mistake their message for one of ego annihilation, or, which is merely the opposite side of the same fundamental error, for one of ego salvation and life everlasting. In my diagram above, the middle segment of an arcing arrow involves the process whereby our essential nature as a human being is socially conditioned to the tribal conspiracy of groupthink, also known as the consensus trance. The natural inclinations and urgencies of our animal body are gradually trained into behaviors that complement rather than disrupt the rhythms of social life. If all goes well, our personal identity (or ego) will carry forward a positive sense of embodiment, of being centered in an organism that itself rides in a stream of primal intelligence we can trust. If it goes otherwise – and I promised that I wouldn’t focus on the problem, so it only gets a mention for now – ego lacks embodiment and we are dissociated from the body’s natural wisdom. The many symptoms of this dissociation are not appreciated as messages and revelations, but instead are medicated or simply ignored. The responsibility of the tribe, then, is to shape our identity through the assignment of social roles and then provide us with the necessary recognition that will reflect back to us the person we are. We are validated as an insider, as one who belongs. All the perks of membership are offered to us: security, attachment, and meaning give our life orientation and purpose. And these can be enough to keep us inside, fully identified with our roles and dutifully chasing the awards and promotions that make them worthwhile. I’ve reflected elsewhere, and many times, on this axis of security, attachment, and meaning in both our fulfillment and pathology as persons. The inherent and inescapable lack of perfect security in life – especially when we are young – motivates our attachment to those who might make up for what’s missing. We can end up locked inside a set of convictions about the way things must be, which allows us to ignore if not outright deny the fact that our shared agreements concerning the meaning of life are also a screen against the present mystery of reality, or the way things really are. Most of us stay right here, for the rest of our lives. With enough distractions, diversions, and intoxicants – perhaps throwing in the anticipation of another, better life later on, next year or after we die – this daily round at playing the person we’re supposed to be can keep us clinging to the carousel and pretending that all of it really, truly matters. When someone comes along who seems not to take the game as seriously, who seems lighter somehow but still deeply centered in him- or herself, we might look on admiringly, feel threatened by the apparent nonchalance, or else elevate the individual as a glorious exception. In any case, we misinterpret his or her translucence as a special possession or extraordinary gift. The light, in other words, is degraded into a unique property of the individual which sets him or her apart from the rest of us. Actually, what we are witnessing is a capacity for transcendence, an ability in that person to go beyond him- or herself for the sake of a deeper and larger experience of life. In our quest for identity, success is measured in ego strength, in our socially supported achievement of a personality that is stable, balanced, and unified under the executive management of a healthy sense of self (ego). Such individuals have it, and this virtue of ego strength allows her to drop the mask for a deeper center of identity, which in turn opens her consciousness to a larger horizon of membership. He doesn’t need to defend his beliefs or clutch at attachments, for he has nothing to lose. These individuals are transparent to reality, like parting veils on the present mystery, glimpses into our own true nature as human manifestations of being. It is to this critical threshold of ego-transcendence that our quest for identity is taking us. Find your center, drop your attachments, and get over yourself. One of the odd and wonderful things about us humans is how an extended period of juvenile dependency, which makes us impressionable to social shaping like no other species, also leaves us exposed and vulnerable to all kinds of social abuse. What could open the path for creative evolution and human progress often ends up shutting us down inside neurotic hangups and rigid convictions. Odd and wonderful, but tragic as well. My diagram is fairly complex, but hopefully not overly complicated. Let’s take a tour by starting with that smaller break-out frame to the bottom-right. Since we were very young, each of us has been on a vigilant quest for three things: security, attachment, and meaning. I reversed their order from how they are presented in the break-out frame to acknowledge their developmental sequence in our early formation. Our deepest and most pressing concern is for an assurance that reality is provident, that what we need to feel safe, included, and nourished is actually there for us when we need it. If it is, then our sense of security functions to open us further to reality. But if we don’t feel secure, our generalized anxiety motivates us to compensate somehow for the missing assurance, which we engineer by attaching ourselves to others with the demand that they keep us safe and satisfied. I’m using the term attachment in a way more consistent with the Buddhist notion than how it’s used in Western developmental psychology, where it commonly refers to the close and intimate bond between infant and caregiver. But let’s keep both definitions together as representing a deep paradox we have all experienced time and again: our closest relationships are often ‘the ties that bind’ us and prevent our necessary freedom and growth. To the degree that attachments compensate for a deeper insecurity – which they are incapable of resolving, by the way – the meaning that we construct around ourselves and those we depend on to manage our anxiety tends to be small, rigid, and closed. It’s small because we can’t risk extending our horizon beyond what we can see and control. Our meaning is rigid in that it lacks flexibility and real-time relevance. And it is closed, which is to say that our mental box excludes discrepant information and alternative views, as it inhibits healthy doubt and intellectual curiosity. Each of us, then, lives inside a narrative construction called a world, and our world both reflects and addresses our historical quest for security, attachment, and meaning. Whether our quest went well or badly in childhood, even now as adults we inhabit a world built on those early emotional codes. Inside our world is where we came to a sense of ourselves as somebody special, with an identity of our own. Despite having reached physical maturity as an adult, this deeper and more primitive part of our personality – what is named our ‘inner child’ – still comes out and takes over whenever we get poked, hooked, or stressed. Let’s move from the break-out frame to the center of my diagram, where a larger representation of that same box is displayed. At the top and bottom of the world frame are two important insights to keep in mind. First, every world is an exercise in make-believe. (I put the word “make” in parentheses to indicate our widespread unwillingness to admit that we are doing it.) In another post I defined belief as pretending to know something and then forgetting that we’re pretending. In other words, we act ‘as if’ our judgments about reality are straightforward descriptions of the way it really is, when there is always an element of our need or wish that it be that way. It’s easy to forget that reality is not made up of words, or that our words – however connected and stretched into broad fabrics of meaning – are not the reality we presume to define. Reality itself, or what I call the present mystery of reality, is just that, something that eludes our mind and its dragnet of language. Of course, so far as we have closed ourselves up inside a small, rigid, and closed frame of meaning (or world), this realization will be vigorously resisted. If meaning is relative and our world is make-believe, then perhaps our identity is a fantasy as well! Hang on to that thought. Those who share our world – or, more accurately, whose constructions of meaning significantly overlap and fuse with our own – are just as committed to the conviction of its truth. We are exactly the somebody special we believe we are, and each of us has our place and plays our role in the web of social interactions that contains and validates our identity. Every scenario is a role-play, every player has a role, and each role comes with a script that seems to drive our behavior without us even thinking about it. And that’s precisely the point: this thoughtless and scripted performance of social role-plays is what keeps our world turning, as it keeps us under its spell. Welcome to the consensus trance. The word ‘trance’ is in parentheses because no one wants to admit that much of our life in society (and even in privacy) is lived in a state of robotic stupor, enacting programs that have been installed in our brains. 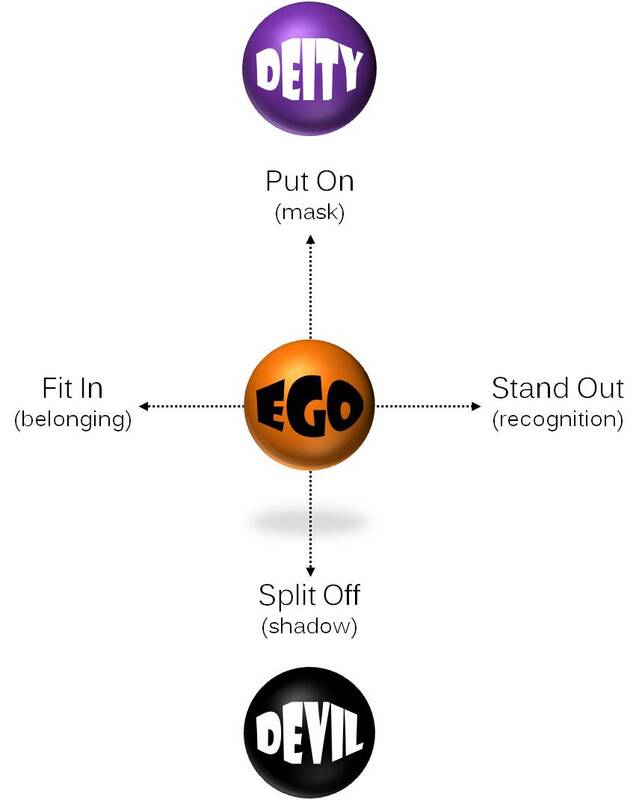 Moving our attention to the center of the frame we find ego, that separate center of personal identity who’s the star of our show. One aspect of personal identity faces the other – other egos, objects, and even the whole shebang of what’s going on (so-called ‘objective reality’). 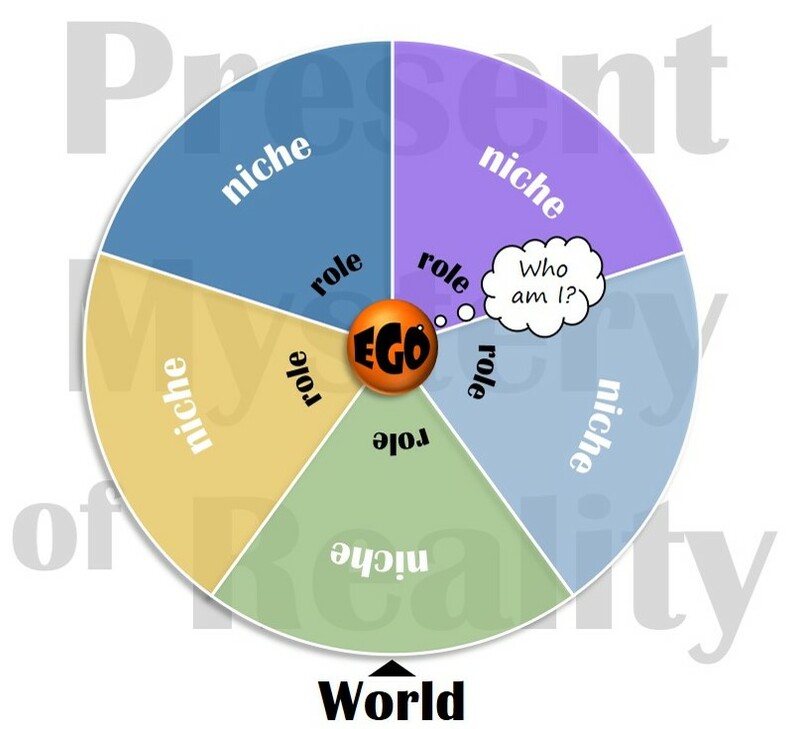 Particularly in our social interactions – which, we must keep in mind, are role-plays in make-believe – ego takes on what we might call ‘modal identities’, referring to who I am in this or that social context. The Latin word persona (“to speak through”) describes the mask a stage actor would wear in personifying a character in a play, usually equipped with a small fluted mouthpiece to amplify volume and aid in voice projection. While our ego’s persona (one of many) displays and projects only what we want others to know about us, there is a corresponding but opposite aspect that stays out of view – or at least we try hard to keep it hidden. This is what Carl Jung named our shadow, and its dark shade covers not only the things we don’t want others to see, but also things about ourselves we have neglected or ignored. In addition to those inclinations and tendencies in ourselves that had to be pushed down and out of sight (i.e., repressed) so we could be accepted and included – and which, as Jung insisted, are frequently projected onto others who then serve as our enemies and scapegoats – there are deeper treasures like creative intelligence, artistic talents, and dormant potential that go undiscovered. Now it should be obvious that when we are profoundly insecure, co-dependently attached, and held hostage by our convictions, the parts of ourselves we are repressing and the social deception we have to carry on just to stay in control (or so we believe) conspire to cut us off from others and from our true self. You might think that since everyone is playing along, what’s the harm? As it turns out, the harm of staying safe and playing small is significant indeed. According to the spiritual wisdom traditions, the serenity we’re seeking as human beings, and which conventionally gets confused with the security we can’t get enough of, is only accessible by a descending path of surrender through the self. The grounding mystery is only found within, as we are able to release our need to be somebody special and simply relax into anonymous being. And the harmony we long for, which gets confused with a quality of attachment that is not even possible, calls us to transcend the demand that others play to our script and take the ascending path to genuine communion instead. What I like to call the turning mystery of unity is beautifully exemplified in the nature of our universe (“turning as one”), but it can be found wherever individual egos can get over themselves and join in togetherness. If we can’t – or won’t – surrender inwardly to the grounding mystery and transcend outwardly to the turning mystery, the consequence is that we end up sacrificing fulfillment on the altar of security; we forfeit community for the sake of our attachments; and we come to despair inside a world that is far too small for our spirit. 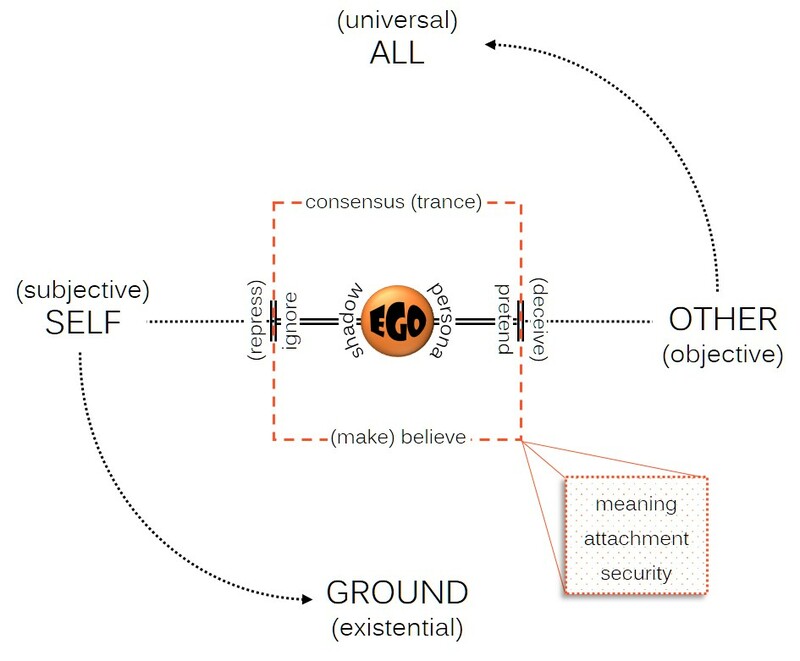 Our preferred orientation in reality is centered in the mental location called ego (‘I’), from which we look out and appraise things according to the standards of “me” and “mine.” The ego is at once insecure, defensive, possessive, and ambitious – and not a little conceited for regarding itself the center of reality. But even this is forgivable when we understand how easy it is to confuse our personal worlds with the present mystery of reality. Before we go any farther, let’s get our bearings in the diagram above. A returning reader will recognize my color codes for the three centers of experience: black for the body, orange for the ego, and purple for the soul. It is of the utmost importance that these distinct centers, or mental locations of consciousness, not be divided into separate ‘parts’ of us, which has traditionally gone down the path of ranking them, opposing them, confusing them, and finally claiming a product of this confusion (the so-called personal soul) as “the real me.” I’ve done my best to keep them all in the picture of what makes us human, even while acknowledging ego as a late arrival and seat of our most persistent delusions. Along the periphery of my diagram I have placed terms that can help us better appreciate the distinctions not only in ourselves (the mental locations) but in the realms of experience our three centers of consciousness open to us. Each of these realms is depicted in a double aspect, with the bolder text naming an aspect which is ‘facing away’ from us, so to speak, and the lighter text naming an aspect that we directly experience. Let’s just step into the diagram and try to make sense of it. At the top is a realm that corresponds to our animal body. As a physical organism, the body is an expression of and participates in a 14-billion-year process that we call the universe. In its aspect of facing away from us – by which I mean the aspect that we speak of in more general (distant and objective) terms – our universe is the universal order of all things. From this philosophical and scientific perspective, the body’s realm has been observed, investigated, probed, classified, measured, mapped, denatured and transformed by human knowledge and technology. As the universal order, it holds together and turns through intervals of rhythmic time, the largest of which is the interval of our universe itself (universe literally means “turning as one”). When considering this order in its aspect as facing toward us, the sensory-physical realm of the body is experienced as a provident universe. All of this has somehow conspired to bring about the emergence of life and ignition of consciousness, providing what we require to survive and flourish. Just pause to reflect on how profoundly and intimately your animal nature depends upon, participates in, and contributes to the great web of life. This cosmic web cannot be reduced to only what transpires here on our planet, but expands outward to include the moon, the Sun, our solar system, galaxy, and far beyond even that. The ‘Goldilocks’ position of Earth relative to the Sun is not simply a matter of local ratios of gravity, light, atmospheric gases, and surface temperature. For a full account we must include The Whole Shebang, from the very beginning and stretching across the entire universe. Before any attempt was made to attribute all of this to a supreme creator, the human mind was overwhelmed by the awareness of living in a provident universe. So there’s our first part of the picture. As our mental location that engages with the realm of matter, the body lives by virtue of participating in rhythmic time and enjoying its place in a universal order at once infinitely expansive and provident. Anytime your consciousness looks out from this location, you are doing it as an organism in communion with the vast web of life. When we shift focus to the mental location known as ego, our point of engagement with reality moves to another realm. Here time is terminal, meaning that it follows a line with a starting point and an ending point. It doesn’t revolve through regenerating cycles like we see in the provident universe, but rather flows from beginning to end along a time sequence that is tethered to our personal identity. While the material substance of our body has recycled through countless revolutions of rhythmic time, and will continue through many more after the body expires and decomposes, our ego, that center of who (as distinct from what) we are, is confined to our biological lifetime. From ego’s position there is a line of time leading up to it, known retrospectively as ‘the past’, and a line projected ahead of it, known as ‘the future’. The past is the sequence of events and experiences which have somehow shaped our identity to this point, while the future is how this center of continuity is anticipated to play out. I use the term ‘play’ in the sense of role-playing, which is the only way ego can stay in the game – as so-and-so who is striving to make something of myself: a respectable character, a good reputation and public image, a successful (whatever roles I happen to be playing). In its less personal aspect, this is the realm of our individual lifeline, which will be summed up by a dash between the dates of our birth and death on a future headstone. Actually, because ego is a social construction that achieves self-consciousness only around the time we acquire language and start making identity contracts with our tribe, its lifeline is shorter than the body’s chronological age. And with the onset of dementia, many of us will to some extent lose our center of social identity before our body expires. We can measure an ego’s individual lifeline scientifically according to this terminal career of executive self-consciousness. But when we consider it from your perspective as the individual in question, this line represents your personal myth. From the Greek for a narrative “plot,” myth refers to the storyline around which the meaning of your life is constructed. We are used to thinking of myths as the fabulous stories that serve to support, orient, and inspire entire cultures, but each of us has our own authorized (and aggressively defended) narrative of identity as well. At various times this identity narrative will suffer assaults from without and within, casting ego into confusion, anxiety, frustration, or despair as its continuity of meaning is undermined. Its greatest challenge, of course, is brought on by the fact that ego’s career is correlated to the life of the body – which must one day expire. Along with other challenges related to its place and value in society, the inevitability of death is something that ego had to work through fairly early on. A solution that we find across the cultures was arrived at by a process of dissociation whereby ego detached from the body and imagined an immortal existence for itself on the other side of death. 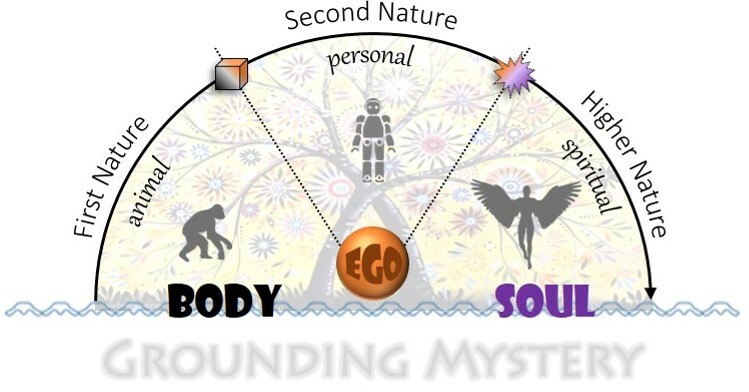 This is where the confusion regarding a ‘personal soul’ took root, fundamentally changing religion’s cultural function from that of coordinating life in society with the rhythms of nature, to securing the postmortem destiny of the disembodied ego/soul. Thus began ego’s impersonation of the soul, and religion’s consequent (and longstanding) betrayal of genuine spirituality. 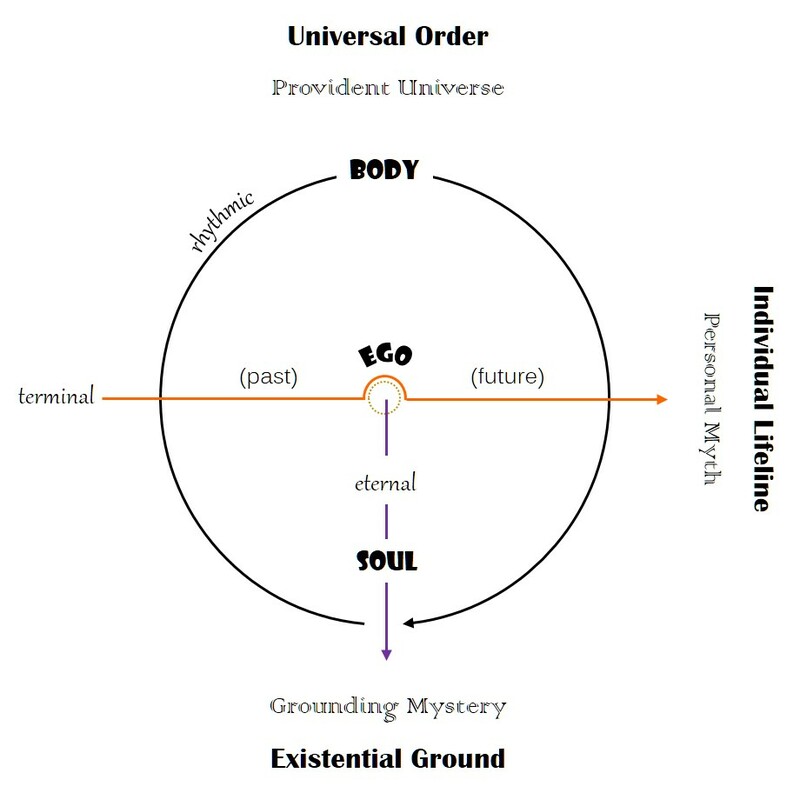 Referring back to my diagram, you’ll notice that the individual lifeline of ego does an end-run around the small circle at the center of the picture. That circle represents the present moment, the only instant in which we can ever touch reality. It is a moment without duration, and for that reason we can legitimately speak of it as ‘timeless’. Even though ego exists always in the present moment, a preoccupation with the past and future of its own personal myth prevents it from fully engaging with the here and now. Besides, given that the present moment has no duration, any attempt on the part of ego to grasp and hold this vanishing instant only serves to further remove ego from the present mystery of reality. So now we come to the third mental location of consciousness, the touchpoint on reality accessed right here in the present moment. Soul is not our center of personal identity, and it really needs some serious deconstruction in order to be liberated from captivity to Captain Ego. It is neither ‘in control’ (as if ego is) nor the ‘part of me’ that survives death and lives forever. Soul is where consciousness engages reality in the deepest depths of our existence, in what mystics have named the ground of being. This ground is neither past nor future, but always and only now. In its objective aspect, which allows us to reflect on it and share our insights with each other, this is the ground of existence, or existential ground, the creative source that energizes, supports, and expresses itself in/as the manifest universe. In logic, the term “existential” is distinguished from “universal” as referring to ‘this one individual’ rather than to an entire class or collective. As a qualifying adjective of the ground, then, we need to be clear that we are speaking of what gives rise to each existing thing, and what can only be accessed by an inward descent of our own existence. This reference to our own existence once again shifts focus to the intimate and experiential aspect, where present reality is felt and known as the grounding mystery of being itself. Its uplift rises as the life energy, nervous state, mental force, open focus, and creative intelligence that conspire in our awareness of this present moment. The “narrow gate” (a metaphor from the teachings of Jesus) which ego is unable to enter for its obsession with being somebody special, is the soul’s path to union with the Really Real. Because it can only be found in the present moment and the present moment has no duration, soul and its ground are outside of time, timeless, and eternal. Mystics and spiritual masters have named it the Eternal Now. In the process whereby ego impersonated the soul, this notion of eternity was equated with and corrupted into the idea of endless time, which was necessary to accommodate the ego’s desperate need to live forever. “Eternal life” and “everlasting life” are very different notions, however, with the latter denoting this idea of an unending quantitative extension of time, and the former (eternal) referring to the qualitative depth of a genuine, authentic, and abundant life in this moment. The mystical undercurrents of our world religions still contemplate and practice the disciplines which allow consciousness to sink below the surface tension of personal identity in order to dwell in the present mystery, an adventure in meditation metaphorically represented as a ‘death’ or dissolution of the self-involved ego. Unfortunately as religion got commandeered and perverted by ego ambitions, this deeper and more original engagement with spiritual life was discredited by emerging orthodoxies, persecuted to the margins, and generally forgotten. Post-theism, unlike atheism with which it is commonly confused, advocates for the necessity of theism in the full development of human beings. If I am critical of theism – referring to the belief in higher beings who supervise and intervene on human affairs – it is not because I think its contribution to our progress as a species is no longer needed, but that its worldview for the most part is so outdated as to render it largely irrelevant to life today. I have explored this loss of relevance in recent posts already (Religion and the Snow Cone Universe and The Three Stages of Religion), so I’ll rest my case for now. 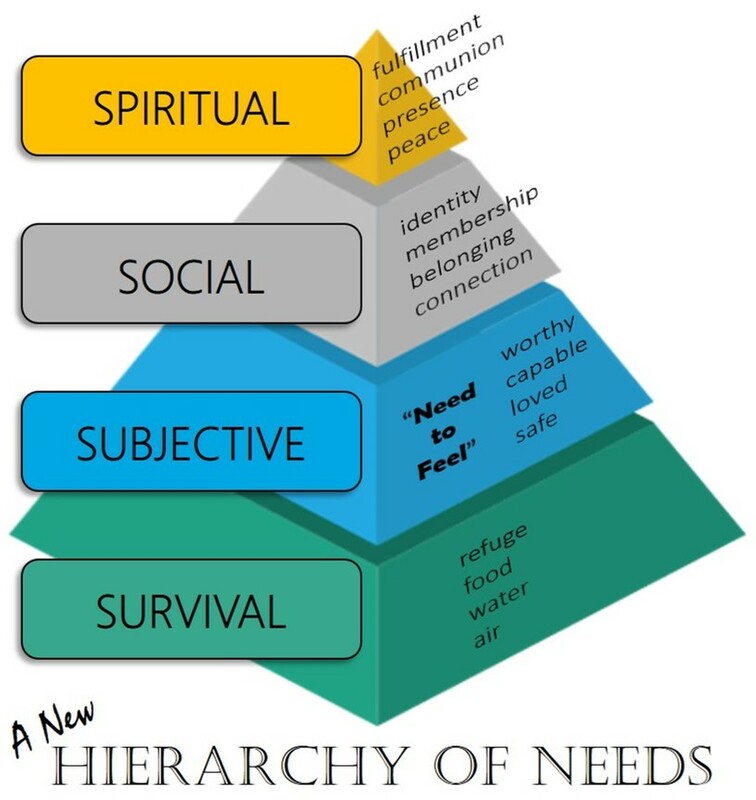 According to the general course of religion’s evolution across the millenniums, theism occupies the middle stage between animism and post-theism, which makes it either a successful bridge or a tragic barrier to what Abraham Maslow named the “farther reaches of human nature.” When it succeeds, the personal ego can be transcended in the interest of communion, responsibility, love, and fulfillment. But when it fails in its essential function, theism locks the ego down in regressive attitudes and self-preoccupation, where “me and mine” become anchors of an insatiable consumerism, dogmatic orthodoxy, and redemptive violence. The present failure of theism is partly due to its insistence on defending an obsolete worldview, but even more to this lockdown on the ego – on its insecurities around death and its ambition for immortality. My title for this post has a double meaning, referring on one hand to the way that god inspires and endorses an acceptable range of possibilities in the formation of individual identity (ego), as a member of this or that tribe. I consider this the essential function of theism. Obedience to the will of god, worship of god’s attributes, and conformity with the character of god as represented in the myths and testimonies of tradition, draw ego development in the direction of this ideal. The other reading of my title is more consistent, in my opinion, with what theism today has become: Ego is god. This is where it becomes “all about me and for my sake,” where religion is reduced to the services that meet my needs and will ensure my everlasting destiny in heaven when I die. If these services and assurance were not there, ego would have no reason to stay with religion or “be religious.” Today churches compete for the attention, entertainment, satisfaction, membership, and fair-trade donations of the ego-as-god. To understand how we got here, we need to examine more closely the process of ego formation and the forces that hold ego together. There is widespread consensus in developmental psychology that ego (referring to the individual’s separate center of identity) is not something we are born with, but must be constructed through the process known as socialization. The ego is thus a social construct and is molded, i.e., disciplined, shaped, dressed up, and acknowledged as “one of us,” an insider, a person of value and member of the tribe. On the way through this gauntlet of moral engineering, the identity under construction must negotiate two opposing values: to fit in with the group, but at the same time to stand out as an individual. It could be argued that the ego’s need to belong (fit in) precedes and is therefore deeper than its need for recognition (to stand out). But then again, the mere urgency of needing to fit in presupposes some degree of separation or exposure. So I will assume that these two opposing values arise together, forming an inherent tension (and anxiety) in the process and product of socialization known as ego. In order to fit in and stand out, the ego must be provided with rules and expectations. Every tribe (referring here to any organized and internally engaged human population, beginning with the nuclear family) will have its conventions as to what being “one of us” must look and act like. 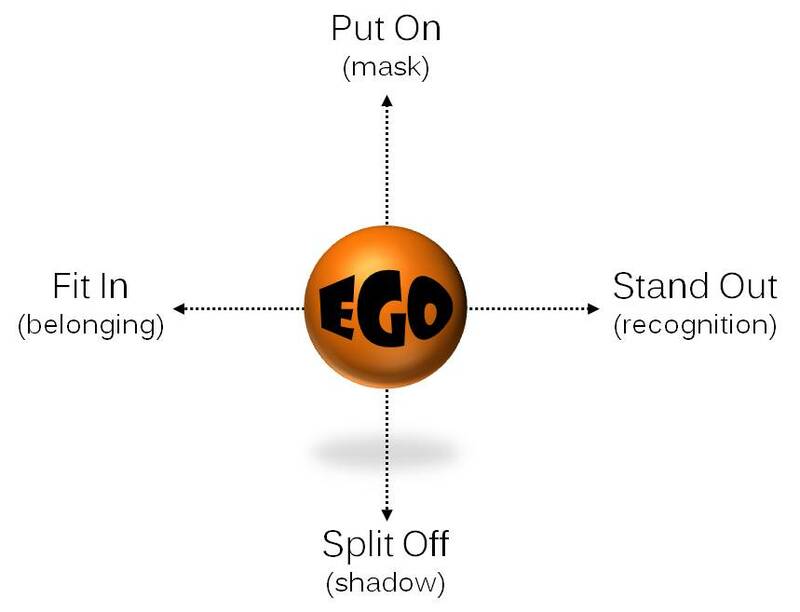 As the individual toggles back-and-forth between belonging (but without getting buried in anonymity) and recognition (but without losing the connection of human intimacy), ego is trying on various personae or masks. Each mask represents commitment to a role, and every role is part of a role-play, the elaboration of which is known as culture. In the early years an individual will try on a variety of masks, pretending to be a doctor or nurse, cowboy or Indian, cop or robber, grocery clerk or celebrity fashion model. Through it all, of course, is the felt pressure to be a “good boy” or “good girl” according to the morality of the tribe. Eventually certain masks will become more or less permanent identifiers, as the identity an individual settles on or is stuck with. Typically these demarcate the roles that will involve him or her in such conventional pursuits as marriage, family, and career. Some masks and the energies they elicit are discouraged by the tribe, as perhaps not appropriate to “who we are” or to the way a good boy or girl should behave. As Carl Jung explained, these roles and their associated inclinations must then be split off and pushed out of sight, in order to ensure the individual’s acceptance by others. This split-off aspect doesn’t just fall away and disappear, however, but lurks behind the ego as its shadow – alluring, scandalous, forbidden, and dangerous. Jung theorized that our full individuation into a whole self is only possible as we are able to come to terms with our shadow and find ways of reconciling it back into our personality. Only then, after integration, balance, and stability have been achieved, can we transcend or go beyond the ego into higher transpersonal experiences. A primary function of theism, as I’ve said, is to arrange and orient tribal life around an image of ultimate reality, personified and projected as a provident agency behind the mortal realm where we humans live and die. The deity (referring to this personified representation in myth, art, and theology) puts on display, as it were, the attributes that devotees glorify in worship and strive to obey in daily life. In this way, the moral development of culture over the millenniums has followed a trending line of ascent, from basic commitments to the primary group, through an opening-up to outsiders (strangers), and into still more enlightened practices of benevolence and forgiveness (as it concerns the enemy). Post-theism urges us to continue this progression, to the point where we have fully incarnated the virtues of our deity – or to put it another way, where the projected image of our own dormant nature is finally reached and awakened in the way we live. At that point we can take up the responsibilities of loving each other, caring for the earth, and being faithful “higher powers” to the generations depending on us. They are just starting out on the adventure of ego-formation, which means that we must be creative mythmakers, wise advisors, and provident stewards of the theism that is shaping them. An important stipulation is that our representation of God (as deity) must be congruent with the cosmology that contemporary science is revealing to us. But whereas theism might lend a bridge for the longer arc of our spiritual evolution, it is currently hung up on the ego – and hung up by the ego, in the form of deities who are calling for jihads, damning outsiders, and demanding purity over love. God’s shadow, which is the condemned and unacceptable parts of ourselves that have split off and taken metaphysical reality as the devil, is seen at work in liberal politics, in the civil rights of minorities, the decline in church membership, and in the general deviance of our youth. In the crusade of true believers and fundamentalists against the menacing shadow of evil in the world, “the devil” is actually magnified and empowered. Violence against terrorism only intensifies aggression, just as the state-sanctioned murder of murderers only justifies more murder as a solution to our problem. The split within us thus gets played out as a split down the middle of reality, and in our campaigns to root out and destroy the shadow in our enemy, we are pushing ourselves and everything with us to the verge of extinction. Ego is not god, but neither is God an ego. The thing that religion seems so desperate to rescue out of the world will bring about the end of the world and take us all down – unless we can wake up first.